Today, I remember the birth of a preacher. 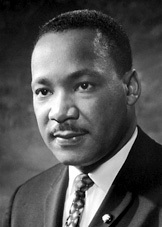 I know that persons will hail him has a civil rights icon. But, I, along with so many others, have not forgotten that he stood behind a pulpit and fought not for civil rights but declared the truths that must be practiced if the kingdom of God is to come to earth. Reducing his words and ministry to legislation would be a travesty. No, he came to give us sight, the vision of how God sees us– equally. God created human beings, no one more or less than the other. It is not God that needs convincing as God knew who He created and why. King came to remind us that we are created equally and until we get it, there will be others. King’s dream was actually God’s first. He was repeating the prophets of old. And this repetition reminded them of where they were headed and now reminds us of how far we have to go, still more chaos than community. This dream of mutual respect and understanding, of unassigned seating at “the table of brotherhood” reminds me that we are not awake, not fully aware of who we really are. It is my prayer that we might wake up from the nightmare of race and its progeny that we might live in Love and in so doing never die. King’s dream was God’s first because it has outlived him and yet, he lives in the hearts and minds of those of us who strive to be reconciled to each other. Long live the King!